Now the hot weather is here I could finally try out an idea I heard of a few months ago. I saw in a magazine an article about making dogs yummy ice cubes to keep them cool on those hot summer days. There were several ideas some of which seemed a bit too bizarre. The one that caught my eye was wet dog food which is something Lottie is not used to as she has a dried kibble diet. I purchased a separate ice cube tray (I'm not keen on dog food flavoured water) and brought my first packet of wet dog food. There are so many on the market it was difficult to choose but eventually I went for the wet verison of the kibble she already has. I filled each hole with a spoonful of wet food and popped it into a freezer bag so it woud not make a mess of the freezer. Three hours later I checked to see if they were done and they were. 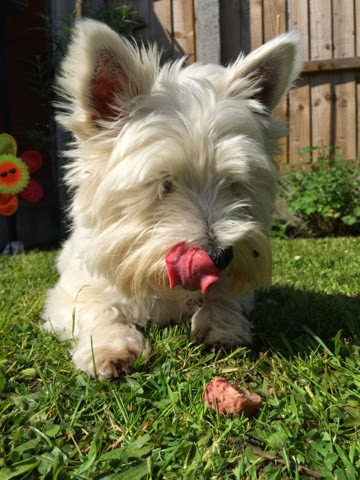 Lottie could not wait to try them. 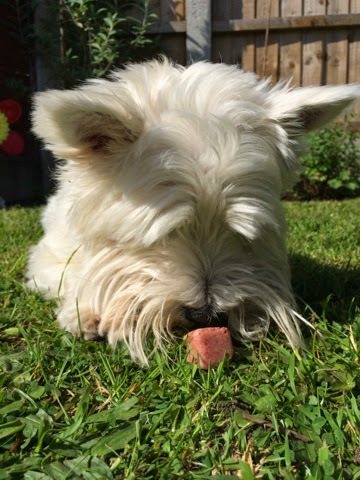 I think it's safe to say Lottie was extremely grateful of a tasty alternative to plain water ice cubes and they were definitely a hit! These are something I will certainly be making again and am now on the look out for other ideas to try. 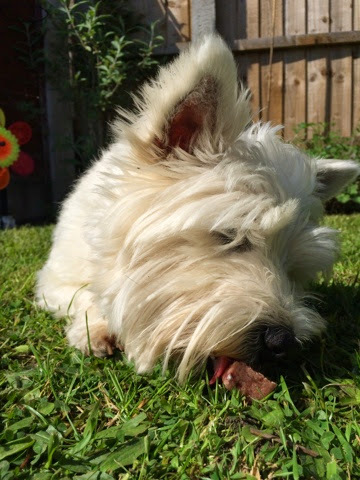 What yummy frozen treats do you make in summer for your dog?